We’ve all had crea tive moments; some have even felt divinely led by an inner voice. How do you practice connecting with your heart and soul? Or are you searching for a way to feel the aliveness and results from trusting your inner voice? My Heart told me that it felt warmed and nurtured by my wearing something made solely to meet its needs. My Soul spoke about the nourishment it received by being honored at the risk of my Ego looking silly and stupid in public. Whether bravely, foolishly, or both – I have worn the original SoulShirt and a variety of others through the ensuing months. Each time, I have heard similar inner messages and felt a warm glow deep inside me. But one can wear the same few things only so often, so I searched for another jacket to transform into a SoulShirt. What about this one? Or that one? Then I noticed an old bright pink wool jacket hanging in the back of the closet. It also ‘asked’ to be transformed into a SoulShirt™. When Michelangelo created the iconic statue, “David,” he said by creating he revealed what he already saw in the rock. The creative process of transforming cloth into a SoulShirt™ also reveals itself. I hung it on a door handle as I mulled over what this one would become. What about another labyrinth? I love labyrinths, and they speak to me about so many things in my life, but I couldn’t find the pattern, and something inside strongly resisted the work of remaking the pattern. What then? I’d been snapping photos of various arches around town in recent weeks, so I decided that this might be a good symb ol to use. I pulled out some graph paper, a mechanical pencil and a compass and drew a rounded, semi-circle arch like several I’d seen. 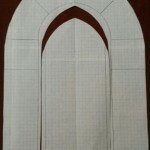 As the pattern neared completion, a rounded arch just didn’t seem right for this jacket, so I redrew it into a pointed arch. If you look closely, you may see the remnants of the original rounded pattern that remain even after I cut out the pointed one. 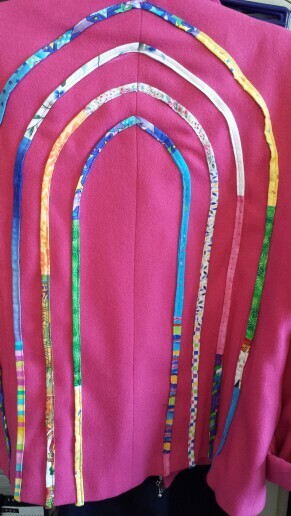 I then traced the arches in chalk on the back of my jacket and pinned strips of scrap fabric on the chalk lines. Once they were sewn on, it was clear to me that two were not enough, so I added two more. I hung it back on my file cabinet handle serving as a hanging hook. What next? My SoulShirt-in-the-making hung there for a week or two as this question hung in the air. Do I add a fifth arch? If I did, where would it go? Inside the smallest one? Would it be a partial one outside the current ones? I didn’t like either of these options, so it stayed the same. One day I turned the jacket around to the front. These arches reminded me of cathedral doors and windows, so why not put rose cathedral windows on the front? Cathedral windows? Really? Right when I’m in the midst of a (another) reorienting of my concept of God? Well, of course! Why not? THIS is not new! I’ve long felt that God has a strange sense of humor. So why should now be any different? Then I realized with awe that I had just experienced another example of how Creative and Contemplative Handwork™ often brings a light touch to heavy topics. Just when it feels like Heaven and Hell are hanging in the balance, my Soul steps in and brings some chuckle-bearing whimsy to my fingertips, lightening my heart and making me smile again. I take a big breath, and another one. Ok, back to the Rose Window. Time to make a pattern, get out graph paper, compass, eraser and all of the other tools I will need. Now to measure, draw, erase and start over again. Finally I get a pattern that appears to be usable. 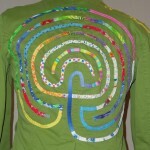 I trace it onto the left shoulder of the jacket and hang it back up. Now I face still another puzzle: what am I going to use to make the rose window on this SoulShirt™? The next step is just as much ‘fun’ as the last. It’s good that I can see the end result I want in my mind’s eye. That vision of the completed rose window keeps pulling me along; it even haunts me when I’m off doing other things. 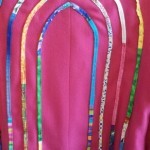 It brin gs me back into the studio and to the sewing machine when I’d rather avoid it. So I keep going. I make the bias strips. I attach the black and the bright ones. And then I start sewing. Before I stitch six inches, I can see that this is nothing like I wanted it to be. So I rip out the stitches and start over. The next time, I get eight or ten inches and repeat the process. The third time, I’ve sewn just three or four inches when I can see that it’s a disaster. “I HATE taking out stitches. Grrr. I hate starting over. Will I EVER get this done?” Then that darn vision of the finished rose window shows up in my mind’s eye again. “Because this whole thing will haunt you forever if you don’t finish it, that’s why”. That quiet inner voice was so right. It would haunt me forever if I didn’t finish it. Some unfinished projects can easily be let go of, and relegated to the trash. Others simply hang around and dog my steps unless and until I return to them and complete them. What dream do YOU yearn for? Do you get frustrated when it takes too long, or is not materializing as you envisioned? Ever want to give up? Until the next time your heart beckons? It’s often something as unlikely as a creative process like this that can effectively turn frustration into invisible hope and then into tangible progress. In Part 3 I’ll continue to share how this process worked on me and led me along my path.